The Europop 12” features the four songs produced by Edwyn Collins and with John Allen as a lead vocalist. 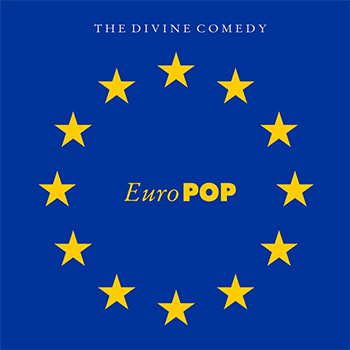 The front cover shows the famous Europop design with the 12 stars of Europe and an ‘EuroPOP’ logo inside. ‘The Divine Comedy’ is printed in uppercase on top with the same font as Timewatch. 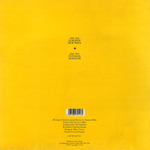 The back cover is plain yellow and features a small tracklisting (with a ★ between the 2 sides). 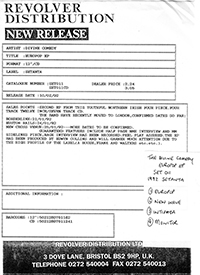 At the bottom are featured the bar code, credits (but they don’t include the band members’ names to confuse fans who expect to hear Neil), catalogue number (SET 011) and Setanta’s address (but non logo). The labels are pretty simple: they are blue and feature the side and catalogue number, as well as band and songs names. They also features the useful note ‘45 RPM’. Near the labels are etched: MPO SET 011 A1 or B1 depending on the side. More exciting than the 12”; the CD features - in addition to the 4 Europop songs - the 3 previous tracks from the Timewatch 12”. So, it is a good way to get all those songs digitally. The artwork is nearly the same as the 12”, but is not exactly the same: the top star has its point between the N and the E of ‘DIVINE’ while on the 12” it’s to be found under the N; the ‘EuroPOP’ title is also higher than on the 12”. On the side the band name is printed again but this time in lower case. At the end of the inlay are printed the bar code and Setanta’s address (still without logo). There seems to be only 6 of them in existence. The insert is of white paper and the sleeve of white cardboard. The labels are ‘MPO’ / ‘Mayking Records’ with 01-924 1661 printed on both sides. On the side A’s label, ‘A’ and ‘19 DEC 1991’ are stamped in blue with the catalogue number in biro: ‘SET011’. Side B only has the ‘B’ stamped. The records were given away with a hand written tracklisting and a small press release from Revolver Distribution with information such as the release date, radio airplay, interviews a live dates.